The REVIT Spring / Summer 2012 collection is one of the most versatile, multi-functional that REV'IT! has ever introduced. There are 26 new designs, some updates of all-time favorites, while others are brand new additions: REV'IT! Horizon Jacket & REV'IT! Spectrum Jacket. 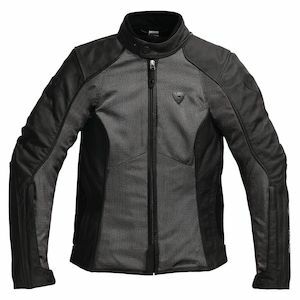 The redesigns are the Airwave Jacket & Ignition 2 Jackets. For 2012 REV'IT! also focused on more Hi-Viz options done in the popular Tornado. There are also plenty of new ladies additions like the REV'IT! Airwave Ladies & the REV'IT! Indigo which compliments the mens' Spectrum. REV'IT! continues to enhance the ventilation properties, making them more versatile and useful in a wider range of climates. Almost all the designs incorporate practical modifications based on user feedback. From new adjustment snaps on the collars of many jackets to the full-length zip on the Airwave pants. The new REV'IT! Stingray race suit one-piece suit incorporates technology from experience in Moto GP, TPU alloy sliders and grip panels on the inside knees for improved contact with the bike.